The Mid-Autumn Festival may be an entire month away, yet mooncakes are already adorning the market. At NaNak's request, I happily decided to oblige and start the mooncake baking early too. A visit to Joceline's blog, and my first batch of mooncake for the year is born. 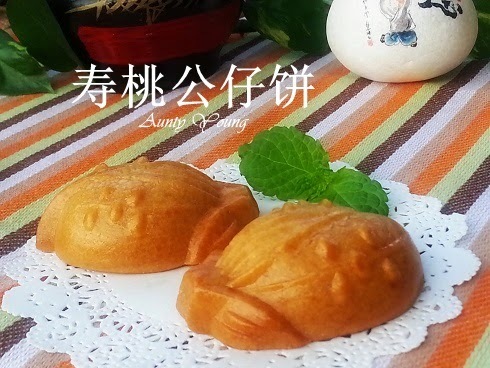 This Longevity Peach Doll Mooncake is indeed softer and tastier after the lotus paste was added to it. 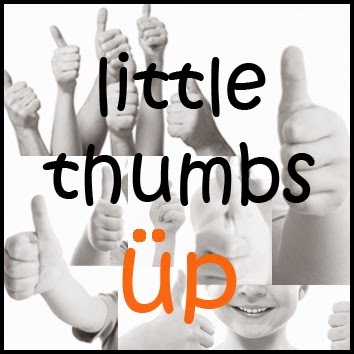 Thank you Joceline for your wonderful sharing. My family loves it! 1. In a mixing bowl, add in syrup,peanut oil.alkaline water and lotus seed paste. Stir mix until well combine. 2. Add in sifted flour and form dough. Cover the dough with a cloth and rest for 2 - 3 hours. 3. Divide the dough into 25g each. Mould into ball. 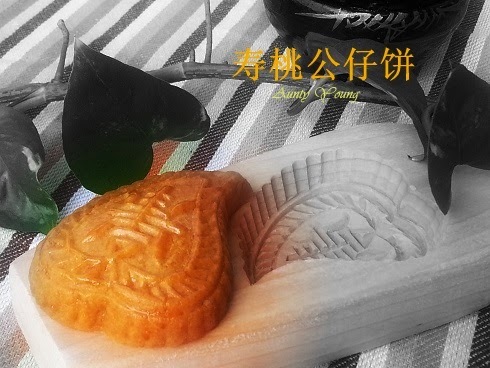 Dust a peach shaped mooncake mould with some flour. Press the dough into mould . Tap lightly to demould. Arrange in a baking tray. 4. Bake in preheated oven at 160'C for 10 minutes. Remove and leave to cool for about 10minutes. Brush the top with beaten egg. 5. Bake in oven again for another 10 - 15 minutes or until golden brown. 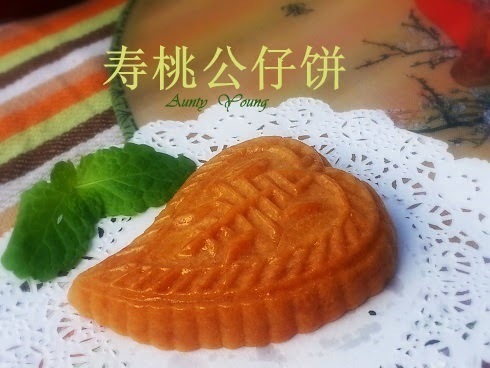 * Adding milk to the egg yolk makes it less concentrated so that it is easier to apply it on the surface of the mooncake. 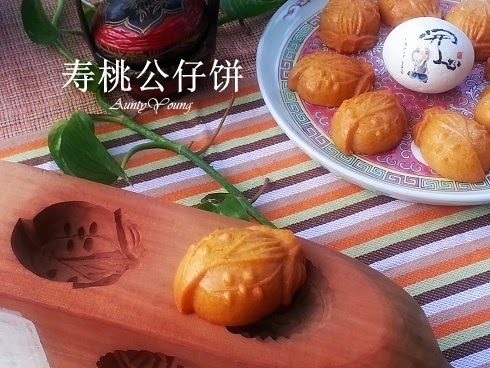 * Wait till the mooncakes are cooled before the egg is applied to get a more even coloring. * Should this mooncake be done correctly, it should be soft, won't stick to your teeth, and can be eaten the next day. 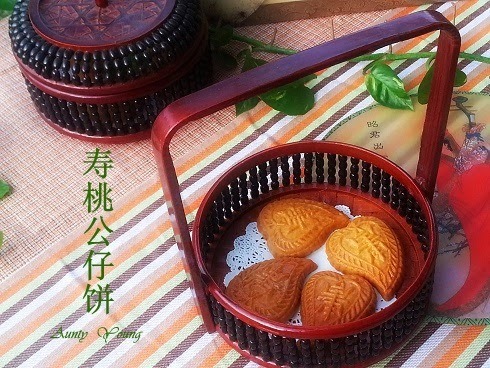 * After allowing the mooncake to cool on a metal rack, it can be kept in an air-tight container. It can be kept up to weeks if it is dry enough after baking. 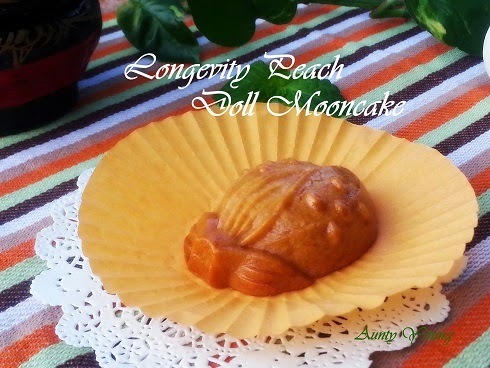 Another Longevity Peach Doll Mooncake of a much cuter style. Doesn't this picture look like the mooncakes are getting slimmer? Haha, don't I wish to be like the slimmest one of all! 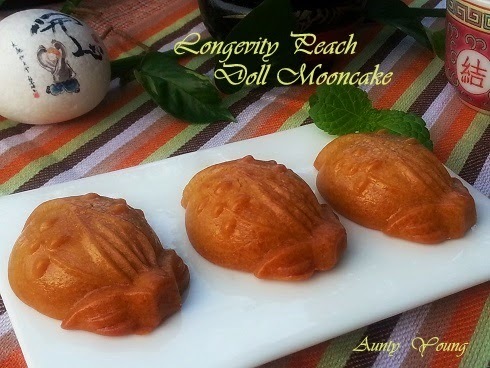 This Longevity Peach Doll Mooncake recipe makes a suitably soft dough which is easy to knead. Once again, many thanks to Joceline for this awesome recipe. With only two mooncakes left, requests for more mooncakes popped up. Therefore, I'll probably be making more mooncakes soon! 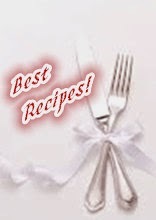 I am submitting this post to Best Recipes For Everyone August Event : Mooncakes hosted by XuanHom's Mom Kitchen Diary. Hi Aunty Young, you are quick to bake mooncakes now. Makes me nervous as I haven't make any and no plans yet. Mind sharing your lovely mooncakes with me. I have this mould like yours and I can make koong chye peang with it. Thanks for the idea, BTW is the pastry skin sweet? Of course I don't mind sharing these yummylicious Longevity Peach Doll Mooncake with you. You can have as much as you like. Also, the pastry skin is just right, not too sweet. Hi Aunty Young, I made these. My hubby says it doesn't stick to the teeth. BTW, I saw the lotus seed paste used should be 150 gm. Is there a typo error here? Well, my saliva is drooling .... so cutie sweet looking Longevity Peach Doll mooncake ^-^! 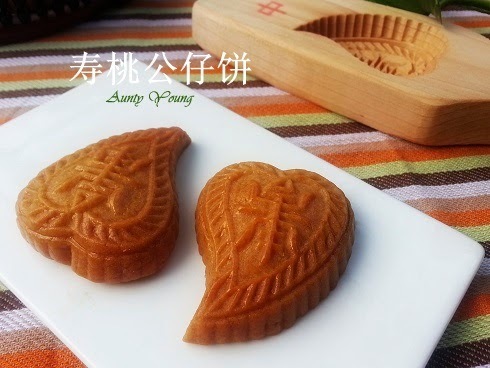 Aunty Young,,you are very fast....i have no clue wat mooncakes I am gg to make yet..
Hi Aunty Young, I love the even browning of your mooncakes and adding lotus paste into the skin is something new to me....I shall try this too! Thanks for sharing.